In my mind, I am not a sprinter. I am a skinny toy of the wind, a climber. After years of half-assed training and lots of racing, and my subsequent failure to move up out of Cat 4, I can also handle the bike better than many I race against. But I am not a sprinter. With this thought in mind, when I planned my "A" priority races for the season, I chose mostly road races, hoping that hills and distance would dwindle the huge packs that I might otherwise have to sprint against. In a three-man breakaway, I figured, at least I'll get third. And if those guys are little climbers like myself, then who knows? In my previous two races this season, I've ended up in three-man breakaways both times and come in third and then second. Today I'm hoping for a first. 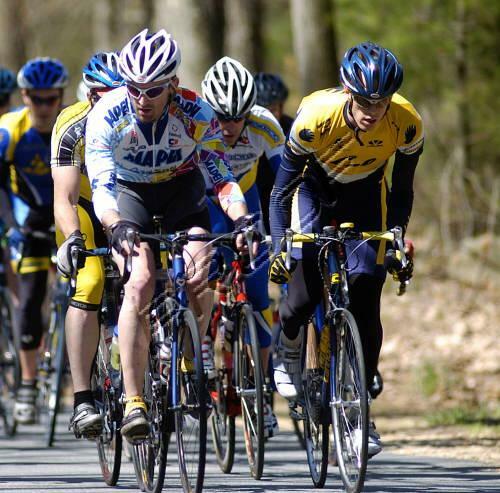 The Sturbridge Road Race, as it turns out, is a terrible race for breakaways. We start with just less than the field limit, 150 jumpy Cat 4s all looking for that elusive upgrade. There's also $400 in total prize money for the first six places, ensuring further mayhem. The course is seven miles long, and we will do five laps. It rolls gently through hills with good pavement and only one scary turn: a hairpin about a mile in. The weather is nice, around 55 degrees and sunny, but with a fair wind. Recognizing the potential for carnage, the organizers neutralize us through the hairpin on the first lap. During out little parade, Peter Bradshaw, my breakmate in my two previous races, rides up to say hello. I'm glad to see him, hoping we can get away once again. As soon as we take the hairpin, a group of two goes off the front. It's way too early to stick, but I want to see who's hungry, so I bridge up to it. We are pulled in within seconds. Okay then. Several more attacks go off and experience the same fate. In the first two laps I go with a few more myself, using the hills to gain big gaps, but we're always pulled in quickly on the subsequent downhills. Others try every conceivable tactic: attacking off the front at the hairpin, counter attacking others' attacks; one guy even tries attacking the perfectly straight, 50-mile-an-hour downhill. Nothing sticks. Convinced it's going to come down to a field sprint, I find a comfortable place to study the course--not so far forward that anyone expects me to work, but not so far back as to get lost in the swarm. I decide that the final hill is crucial. Each lap, someone attacks it hard, stringing out the pack. Then a hard right turn strings us out even further. Everyone outside of tenth place or so has to really work to get back into the draft. And although it's a long, long slog to the finish, we're confined to the right lane until we pass a church about 500 meters out, meaning it will be impossible to move up. I also start paying attention to who comes through the last corner well and find a guy with "Mariella Pizza" on his chammy that always comes through hard and jumps even harder to get back into the wind. With my plans set, I rest, trying hard to stay out of the wind and do no work. It's actually pretty easy, and I'm surprised how calm we are for so large a pack. Peter, on the other hand, was stuck near the back at this point, and said it was anything but calm. But at the time, I was impressed. As planned, I hit the last hill really hard on the final lap, cresting it in sixth place or so, my favorite spot. The turn goes well and I find my pizza man's wheel. A few others pull through, and our speed is good. As we pass the church, giving us full use of the road, things go ape. In a bike race, a crash always sounds like it's right on top of you, and it is a terrible sound. You can hear the difference between carbon and aluminum hitting the ground, and at 40+ mph, they're both really loud. I have no idea what's going on behind me, but it sounds like every one of the guys I can't see is involved in a pileup. I try not to think about how happy I am to be alive and concentrate instead on the sprint. All of the leaders are still upright, and I need to pay attention. Things are also starting to bunch up a bit, making the possibility of another crash a reality. Then John from the Boston Road Club yells "GO! GO! GO!" at the top of his lungs, and his teammate near the front takes off, stringing us back out and returning structure to the race. I feel like there's no way I can make the jump, but I hammer the pedals, spinning up through my remaining gears. I'm now somewhere in fifth through tenth, and I'm already in my 53-12, my highest gear, pedaling at least 130 RPM. I curse my lack of an 11 tooth cog. But the sprint is long, and people are fading. I feel the burn build up, but I'm still in a draft, so I know the guy in front of me is hurting worse. At the last second I give it one more kick, coming around him and throwing for the line. Peter and John in the Harvard jersey and I are all neck and neck. Another guy makes his move at the same time, out kicking all of us by a wheel. It's over, I am not spread all across the pavement, and apparently I've become a bit of a sprinter. When the results are posted, the winner is unidentified, but I'm listed in second place, with John and then Peter behind me. We earn $80, $70, and $60 for our efforts, recouping our entry fees and most of our ZipCar rentals, too. More importantly, I earn 5 more upgrade points, giving me 10 of the 20 I need to upgrade to Cat 3. It's not the first place I wanted, but given that I did it in a field sprint, I'm totally stoked. We learn from another of the Boston Road Club guys that the crash was smaller than it sounded, about 10-20 guys. Ambulances were called in, but no helicopters, always a good sign. I hope you guys are killing Yale at Easterns. sun. They did not take the race seriously except among themselves.